Job growth in Chicago picked up to its highest level in nearly two years, as manufacturing job growth surged recently. 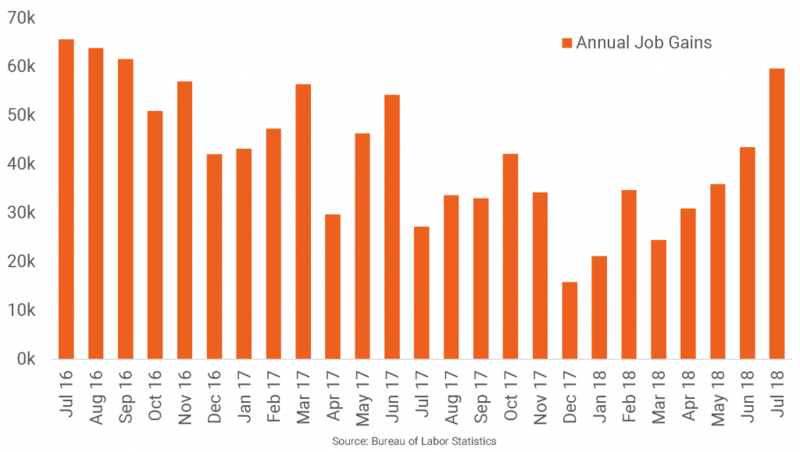 The metro gained 59,600 jobs overall in the year-ending July 2018, a 22-month high, according to the Bureau of Labor Statistics. Particularly noteworthy in those growth numbers was the 10,400 manufacturing jobs added in past the 12 months, which was the best performance for that sector since 1998. As a result, the total number of manufacturing jobs in July reached the highest level in Chicago since early 2009. Aside from the phenomenal growth in manufacturing, the professional and business services segment and the leisure and hospitality services sector each contributed roughly 10,000 jobs to the metro’s annual job performance. Both figures are well above each sector’s recent performances. Previous Article: Which Small Markets are Appealing for Acquisitions?